Best Tennis Player In The World Shares Moment With Ball Boy That Has Fans Melting. It’s always nice to see a living legend who has ascended to great heights in his career, yet still has not gotten a big head. Novak Djokovic is a Serbian tennis player who is considered to be the best men’s singles player in the world. He’s also known as being a devoted husband and father who enjoys goofing around a bit, both on the court and off. In fact, his antics are so well known that he has earned the nickname “the Djoker” among tennis enthusiasts. 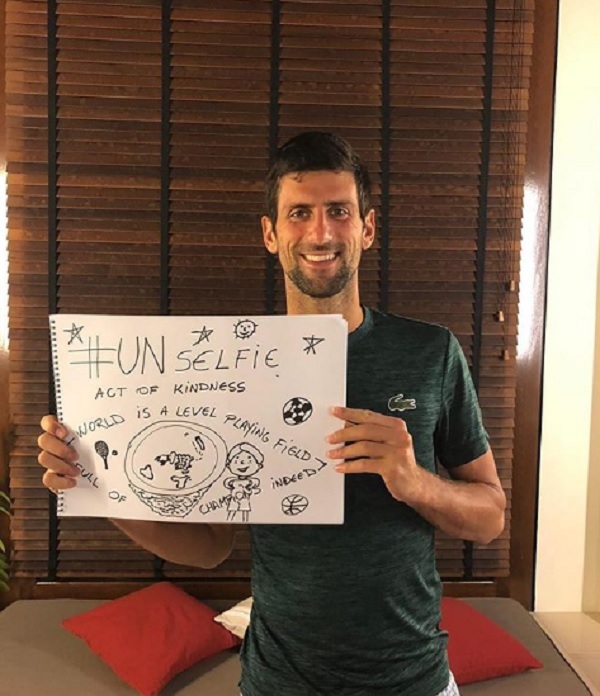 In spite of the pressure all professional athletes face, Novak has managed to “keep it real” in many ways. He actively donates to charities to support his native Serbia, and he habitually promotes kindness and empathy on his social media pages. Even knowing what we do about Novak’s personality, one small act of kindness from a past match will always warm our hearts. 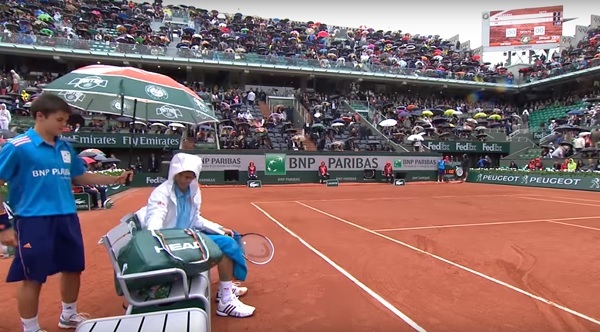 During the 2014 French Open, the skies opened up and it started to pour down rain. Officials delayed play for safety reasons, so Novak took a seat court side and waited for the weather to clear up. Behind him stood one of the most important unsung heroes of professional tennis, the ball boy. Ball boys are responsible for rushing onto the court to gather and disburse balls. They also provide towels for the players, remove plastic sleeves from new rackets, and work in the sweltering heat for very little, and often zero pay. 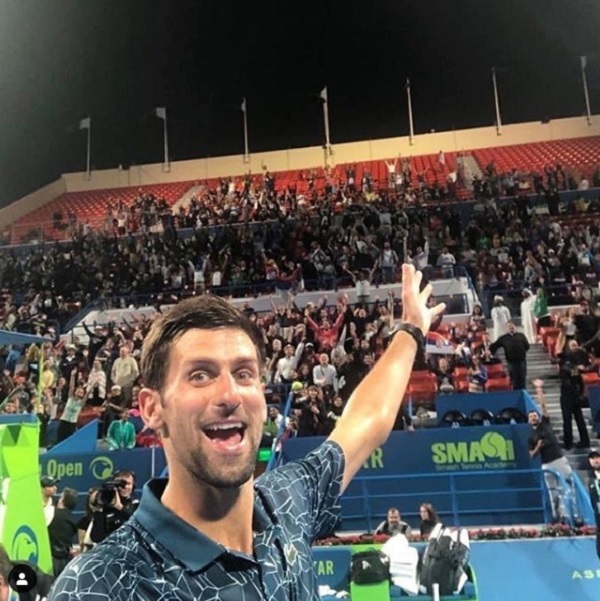 Since their job is to be invisible, everyone was shocked when Novak not only noticed the ball boy holding an umbrella over his head as it rained but turned around and invited the young man to sit down next to him. The young man seems absolutely delighted to be invited to sit next to the greatest tennis player in the world. He’s most likely a huge fan of the sport himself, so just being in close proximity to a legend is thrilling! For several minutes, Novak sat with the young man and chatted. Eventually he took the umbrella from the boy and reached around him to produce two soft drinks, which he offered up as if it were the most natural thing in the world. “It was a nice, fun time, something unusual for the grand slams,” Novak later explained. 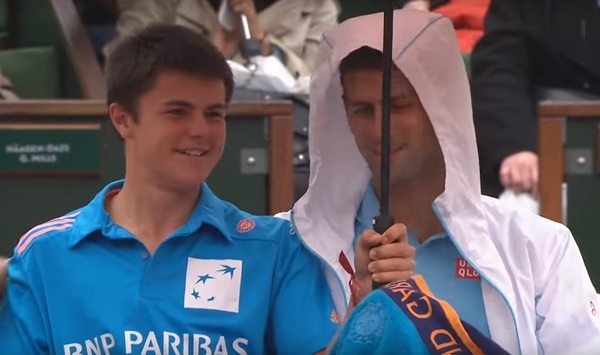 Once the rain let up Novak went on to win the match against Roland Garros, but everyone in attendance that day agreed that it was the young ball boy who was the true winner. Novak’s example is so important in today’s world. Many young people idolize celebrities, so it’s nice to see a celebrity who seems genuinely worthy of that affection. Just chatting with this young kid shows a basic respect for others that is sorely lacking in many athletes. Well done, Novak! You just gave this young man a story he’ll cherish for his entire life. Watch Novak sharing a beverage with his ball boy in the video below, and don’t forget to share.